In the early Fifties Paolo Soleri returned to Italy after his first sojourn in the United States. After transforming a small bus into his first travelling home-studio, he began a journey across the peninsula, during which he also visited the Amalfi coast. While staying at Vietri sul mare to learn the ancient art of ceramics, he met the Solimene family of ceramists and was entrusted with the task of designing their new factory. This building still remains an example of work of architecture which clearly succeeds in turning an appreciation for the ceramic process and its ancestral fascination into a factory. 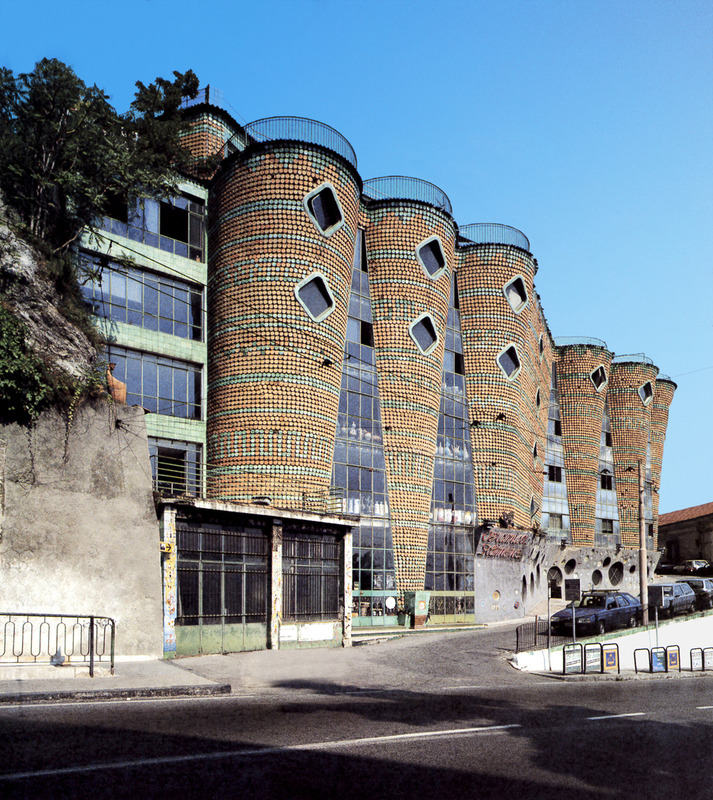 The compositive structure of the factory is characterized by vertical and circular developments, inspired by the process of turning at the wheel, where the vases are moulded in an ascending movement. The traditional wood-fired kilns echo this vertical development. 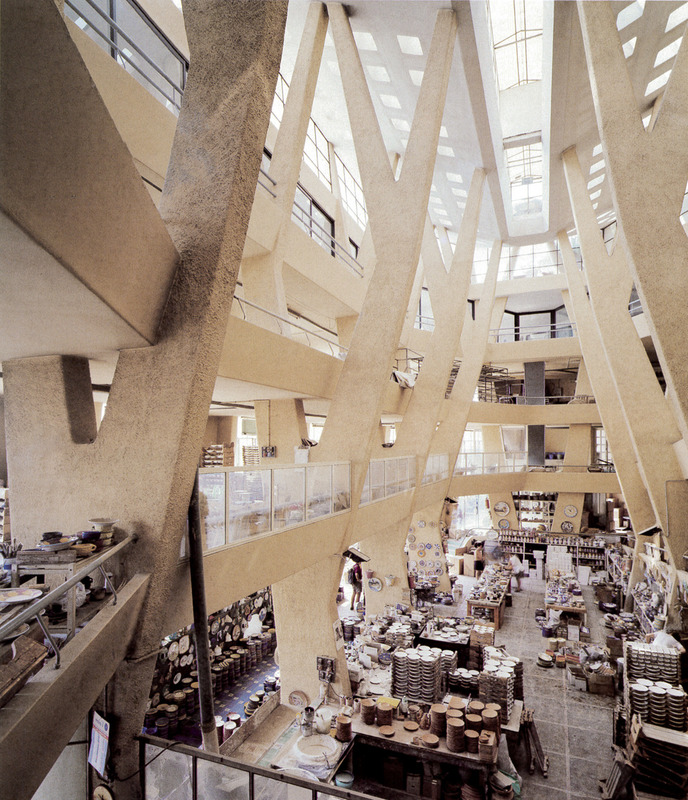 The factory building is organized in a series of hollow volumes that flare upwards so as to allow as much daylight as possible in the interior, while the surface of the façade gives the aggregate a graphic texture. Inside the building a helical ramp starts at the ground floor, which houses the commercial area and the showroom, connecting it to the upper floors where the crafting takes place. A fascinating forest of pillars left in view forms the structural web capable of connecting this spatial complexity, while the ramp serves as horizontal bracing element. The idea of cyclical, continuous space as itinerary is clearly linked to the organic quality of Lloyd Wright’s Guggenheim Museum in New York. The external façade consists of a series of frustum volumes with an undulated development, connected by projecting triangular windows. 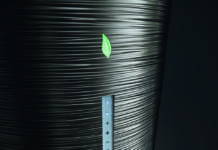 It is characterized by the facing elements, consisting of regular discs arranged in rows. Bottoms of terracotta vases, shaped as the ancient amphorae which have reached us from Roman architecture, unglazed or with bottle green glaze, which – immersed in the concrete – cover and decorate the façade. The pattern formed by these elements represents the most evident bond with the location, but it is also a very simple way, which still works efficiently today, fifty years after its realization, to reduce the problems associated with insulation and maintenance of the façade. The adequate use of a material in this part of the building becomes a link with history, with the material and anthropological culture of a place, creating a sense of continuity with the ancient tradition of pottery which has distant roots in the Arab world and the diffusion in the entire Mediterranean of a technique which allows, like the polychrome majolica domes to be found here and there along the coast, to produce a completely modern language. 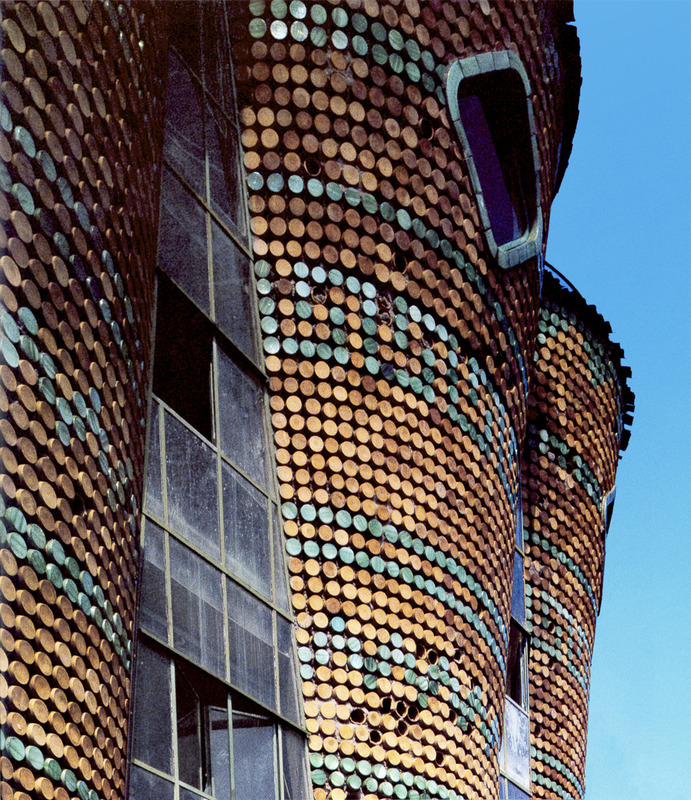 The contemporary use of an undulated masonry structure on the façade and its completion with small points of colours, pixels which exalt its web, create an effect of continuous movement which, yet again, evoke a marbled surface, but also a continuous plastic movement like that of unfired clay. The most immediate visual association is with Antoni Gaudì, and especially his row of petrified trees at the Park Guell in Barcellona. But in spite of these references, Paolo Soleri’s work is a unicum which never neglects the requirements of a modern industrial factory, the requests of the Solimene family at Vietri sul Mare, its needs and its identity. An attentive observation shows that this sense of continuity is precisely the element which most evidently links a place, the Mediterranean, to its material culture through a characteristic craft as that of ceramics. In fact, to reconstruct the interactions which have led to the diffusion of pottery in the Mediterranean basin inevitably means to speak about peoples, routes and cultures in a kind of adventure which, going beyond specific contexts, contribute to give a more general and concrete meaning to the very idea of Mediterranean. A story which, even if it concerns the evolution of a traditional craft over time, speaks to us like a water-coloured story by Corto Maltese, about the colours and the forms, the vicissitudes of all the peoples which have made the Mediterranean its home over the century, laying the foundations for the very history of mankind. First Cretans and Mycenaeans; later Macedonians, Romans, the Byzantine and, immediately after them, Islam. The ceramic production is an embodiment of the very idea of Mediterranean, expressed by Braudel as a “scar tissue” between the Western culture and the Eastern one. A concrete world which is transformed into a fairy tale with an explosion of colour. In its various local forms, ceramics bear witness to Gillo Dorfles’ idea of the existence of a “creative peculiarity” which brings together the people of North Africa, the Greek peninsula, Italian, Iberian, with the shores of Asia Minor and the great islands of Sardinia, Sicily, Creta and Malta, uniting the generations in time. Marbled, luminous and intense colours have been diffused through ceramic decorations in the entire Mediterranean basin; Persian blue, obtained by grinding lapis lazuli stone, cobalt, emerald green and white, in a research inspired by the universe of colours characterizing the sea. It is precisely the ocean which has served as inspiration for another two projects, in different periods and by different designers, united by a similar way to combine the local and universal properties of ceramics. The first is the Parco dei Principi Hotel in Sorrento, designed by Gio Ponti in 1962. 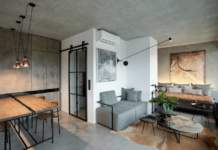 In the interior the decorative motifs of the ceramics used to cover the floors, and the white and blue pebbles embedded in the walls, form a decorative system which is clearly inspired by the surrounding seascapes. Ponti reproposes the combinations used in two villas, the Arreaza in Caracas (1956) and Nemazee in Teheran (1957-64), adopting two colours also in the design in Sorrento, where he designs 30 decorations in blue, using a single tile module measuring 20x20cm. He identifies a chromatic series for each room, thus creating a hundred different combinations, which corresponds exactly to the number of rooms of the hotel. In the public areas on the ground floor – the reception, hall, smoking room, restaurant and bar – the decoration is also applied on the walls, where panels in white and blue majolica created by his friend, the artist Fausto Melotti, are mounted in the walls. We may conclude our short itinerary with the Toledo station of the Subway of Naples, recently designed by the Catalan architect Óscar Tusquets Blanca. In the corridors that lead from the surface to the underground area, after having passed the first escalators where the ochre colour of the surface dominate, echoing the Neapolitan tufa stone of the buildings, the level which descends below sea level is marked by the entrance to the Ocean Tunnel in which Bob Wilson, wanting to recreate the mobility and colour of the water habitat, has faced the walls with ceramic mosaics, covering them with marine motives.